This is where random stuff about me appears. My lovely wife Terry and I go to Burning Man where I do sewage treatment among other things. The Seeburg 1000 Background Music System featured 16 RPM record players that provided background music in the 1960s and 1970s. I have a few players and a bunch of records. You can find a bunch of MP3 files of the music, along with some Billboard magazine articles and some player photos, here. I used to have an old Presto 6N record cutting lathe and 92A amp. It found a new home in New York. Don't ask what the shipping cost. I enjoy picking locks now and then, only to prove a point. Here's the DVD lock picking guide. I enjoy collecting bits of old computers; I also enjoy collecting pictures of them because they weigh less. Perhaps you like Friden Flexowriter stuff. 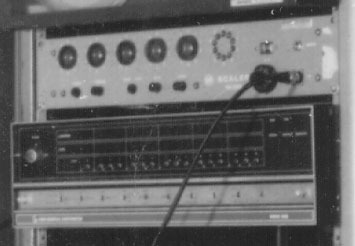 HP used to make frequency counters using all-tube technology. The basic unit was the AC-4 decade divider module, using four tubes and either ten neon lamps or a Nixie tube for readout. Here's the HP AC-4 Counter manual. Maybe you have a Fluke 8100A or 8100B nixie tube voltmeter. Here are the schematics. Ever seen a CDC 6600 computer module? They are quite sophisticated. I found this Remington Rand computer module on Ebay. It is probqbly from 1957 or so. A long time ago, people used primitive, analog means of displaying numbers on CRTs. Here's an example of this. People used to listen to shortwave radio to learn what time it was. "At the tone, 15 hours, 43 minutes, Coordinated Universal Time". This Beckman 905 WWV receiver is a decent boatanchor with which to pass the time listening to the time. Remember American Used Computer in Boston? Here's the proprietor. 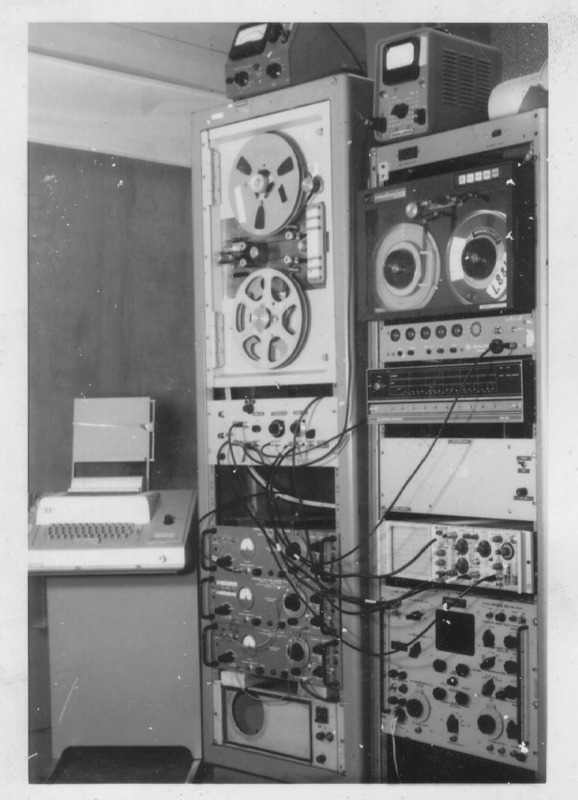 In 1972 my dad did some data reduction with this computer. Here's a close-up of the Nova mini and Dekatron counter. HP (Hewlett Packard) made a cute 1.3 inch disk drive called KittyHawk in 1993.
with a chapter from an unknown book that tells how it works. 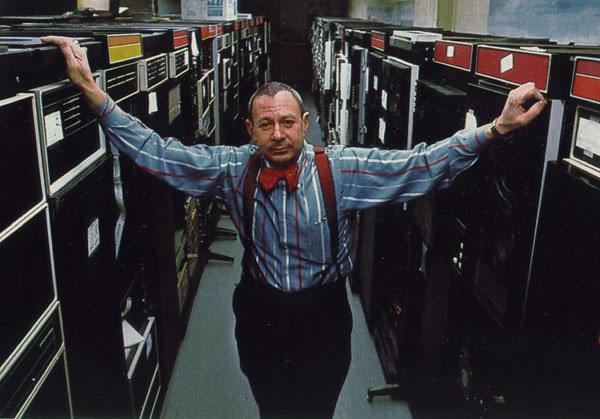 Speaking of memory, have you ever wondered how core memory was made? I make clocks and a wristwatch using nixie tubes and CRTs. I recently built a rubidium "atomic" nixie clock. Building a nixie clock? 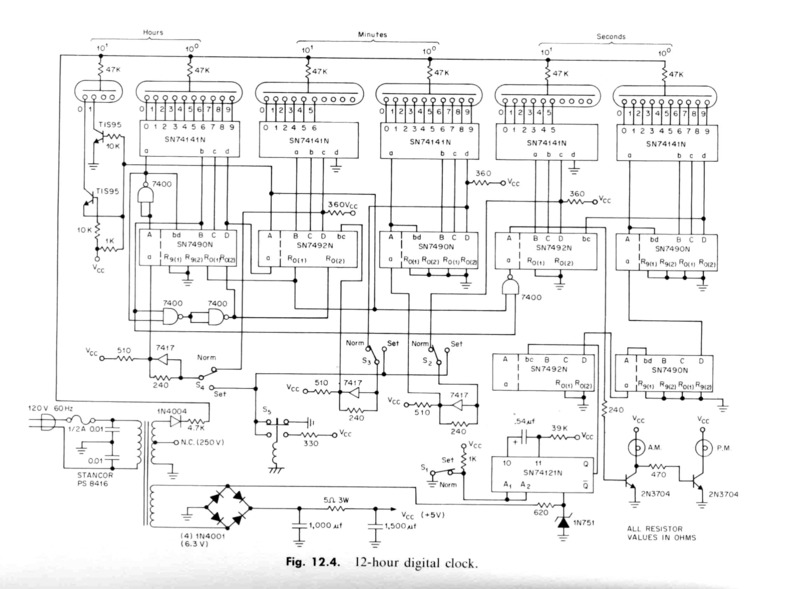 Here's the TI TTL Designer's Handbook clock schematic diagram. I redrew it in a more logical order here. 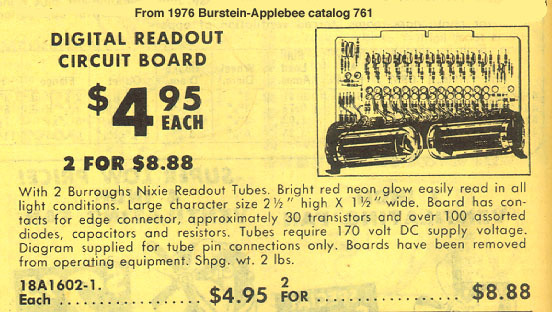 Here's a 1976 catalog page from Burstein-Applebee for the B-7971 giant Nixie tubes, as used in the Four Letter Word by Ray Weisling. 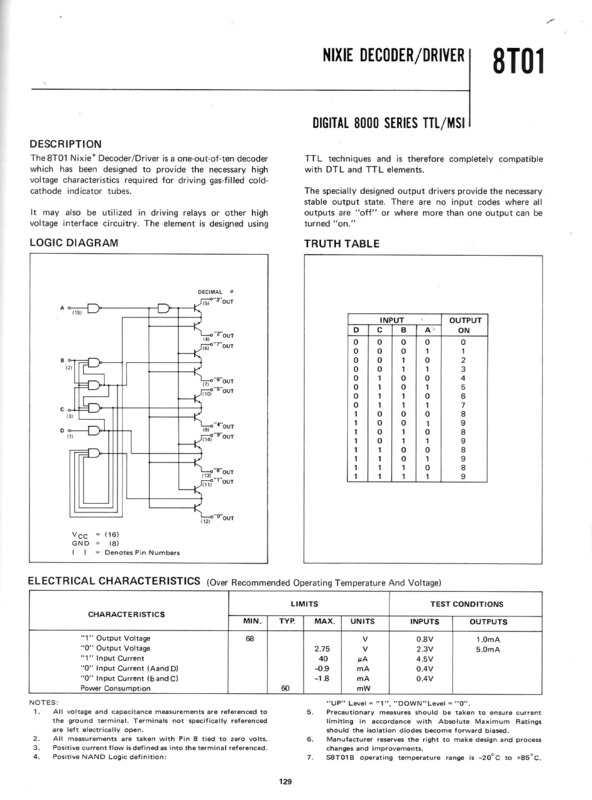 The data sheet for the Signetics 8T01 Nixie driver chip. Here is some PIC code to make a MM5369 chip emulator. Haydu made a beam switching tube to count pulses back in the 1950s. One of my engineer relatives built a handmade desk calculator back in the early 1970s. Nishijin Super DX pachinko game instructions, straight from the factory (c.1976) and in Engrish. A hundred years ago, this is what a bank check used to look like. Here are some old family photos. This is my fixed-gear bike, a Frejus that's about as old as me. 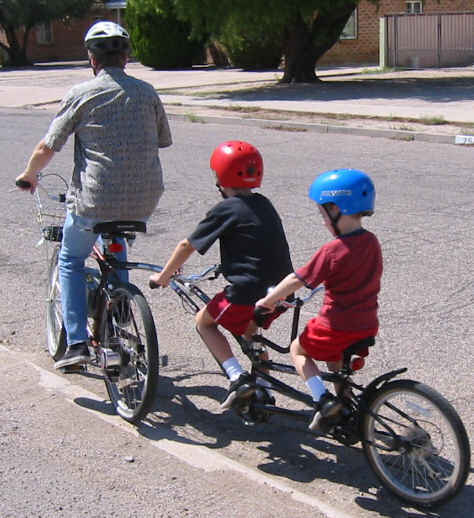 Me and the kids on the triple trail-a-bike. A big 700K PDF of a nice article on scope clocks and nixie clocks from IEEE Spectrum. Sniffing glue is bad. See why in this filmstrip. Page updated on Sept. 11, 2008 by David Forbes.